Abbott and Costello’s famous comedy routine ‘Who’s on First’ is a cherished slice of baseball popular culture. It has been copied and adapted with varying degrees of success over the years. Illustrator John Martz is the latest person to take on the task of living up to Abbott and Costello’s extraordinary performance of the routine and he more than does their memory justice. The book is primarily designed with children in mind, but the adults reading along with them – and the adults who pick up the book for their own pleasure – will get just as much enjoyment from it. The routine plays out over the course of 40 generously sized pages, giving Martz plenty of space on which to let his imagination flow. In Martz’s version, the characters of the routine take the form of animals, birds and reptiles. The coach, Abbott in the original sketch, is turned into a tall brown bear, whilst the inquisitive Costello wanting to know ‘Who’s on First?’ becomes a white rabbit. Abbott’s first run through of his men on first, second and third is met by a brilliant full-page picture of the rabbit Costello’s bemused face, whilst later on a full-page spread is left uncluttered beyond the pair screaming “THIRD BASE!” in unison. The fun, colourful characters and backgrounds will catch any child’s eye and Martz helps the routine along by signposting every new ‘name’ with a picture of every player, as if looking at you from the back of a baseball card. Abbott’s reply of “Why” to Costello’s question as to the name of the team’s centre-fielder is made all the funnier by the baseball-cap-wearing crocodile appearing alongside the speech bubble. 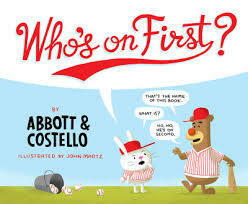 Matching the clever and hilarious script of Abbott and Costello with Martz’s engaging animal characters is a winning combination, coming with the added bonus of giving a baseball-loving parent an excellent opportunity to surreptitiously introduce the sport to their young ones. What more could you want from a baseball-related illustrated book? Have you read “Who’s on First”? Feel free to share your thoughts in the comments section below. Can you recommend any other similar books? If so, let us know.